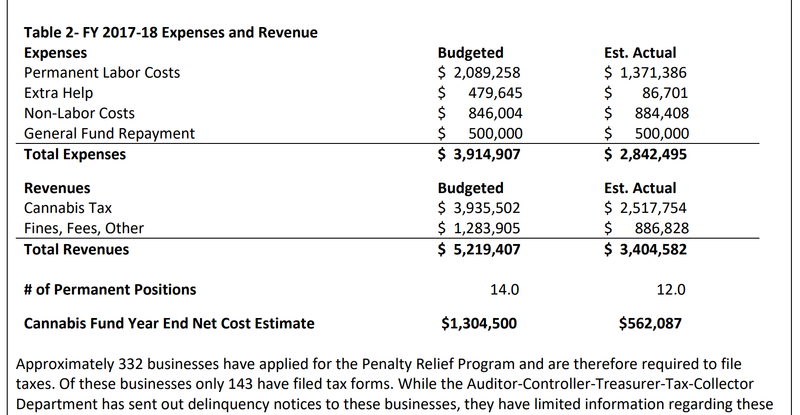 This is a sheet the county prepared of delinquent marijuana taxes for growers. There are 29 scofflaws who are behind in paying their taxes, and the spreadsheet lists the current amounts in arrears. In some cases the amounts due are over $60,000. 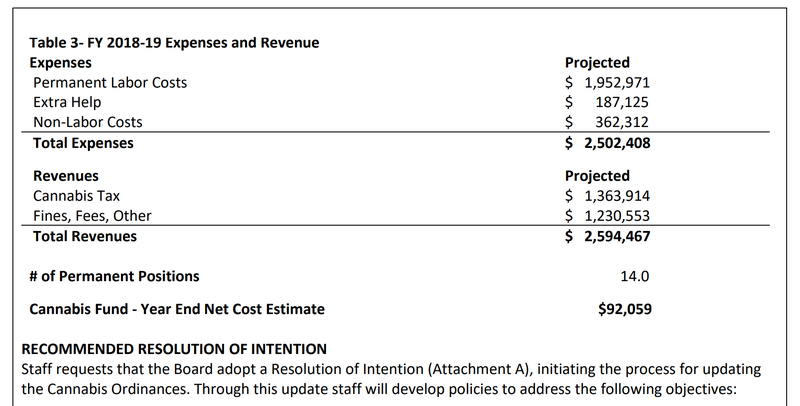 At the April 10 board of supervisors meeting, the board received information about revenues and expenditures from the pot program. This information is also attached. The county will make about $562,000 this fiscal year and about $92,000 next fiscal year. However, this accounting does not consider “off the books” expenses. Supervisor Zane asked the sheriff how much the investigation of a murder costs, and he responded $1.5 million. He said this does not include costs of the District Attorney’s office or the Public Defender’s office, so the murder in the home invasion this spring probably will cost about $2.0 million. The county is also giving huge real property tax breaks to some industrial marijuana “farmers” under the Williamson Act, which is intended to preserve open space and traditional agriculture. The notion that supporting marijuana cultivation would be bring huge tax windfalls to the county and support other programs is proving to be another mirage. If you have any comments you wish to make about county policies on this issue, go to our contacts page for email and phone numbers.